CG Says: The 2019 Hyundai Accent is essentially unchanged after last year’s redesign. LED headlights are a new feature on the topline Limited trim. The Accent is a subcompact sedan. 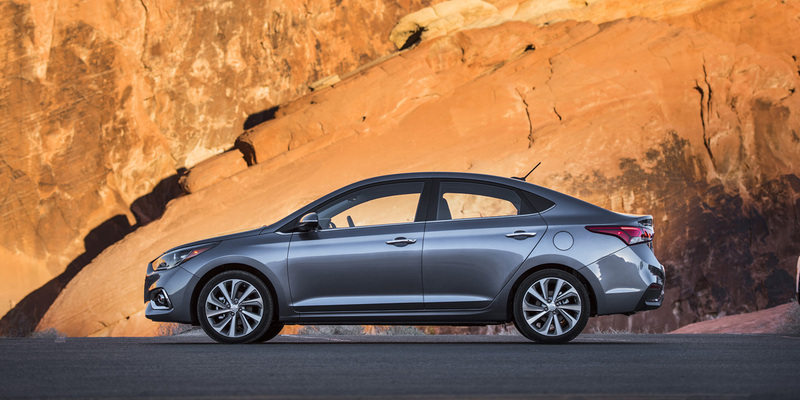 Hyundai no longer builds an Accent hatchback. The straightforward model lineup ascends through SE, SEL and Limited models; there are no options or option packages other than accessories such as floor mats. The sole engine on all Accents is a 1.6-liter 4-cylinder that is rated at 130 horsepower. The SE model offers a choice of a 6-speed manual or 6-speed automatic transmission; the automatic is standard on the SEL and Limited. The line-topping Limited includes features such as forward collision warning with autonomous emergency braking, keyless entry and starting, power sunroof, hands-free trunklid release, 17-inch alloy wheels, and Hyundai’s Blue Link remote connectivity services.